Members of the Puerto Rican music group Calle 13 say they don't care if their upcoming concert in Cuba is criticized by exiles in Miami who oppose the communist regime. The award-winning group is set to perform Tuesday at the open-air Anti-imperialist Plaza, which sits in front of the U.S. Interests Section along the waterfront. The group won five 2009 Latin Grammys including album of the year for its music, which mixes reggaeton with elements of hip-hop. 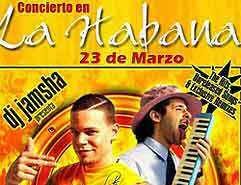 Calle 13's Cuba appearance will be followed by concerts in Miami, where the band expects a backlash from those who see their outreach as tacit support for Cuba's communist government. Lead Singer Rene Perez said Monday that it's "all the same to us" what the exiles think.